View More In Rain Barrels. Gray and black barrel not included. Modeled after English Rain Barrels, the Great American Rain Barrel is a recycled olive shipping container that holds 60 gallons of precious rain water. Our barrel is one of the largest capacity rain barrels available today!. 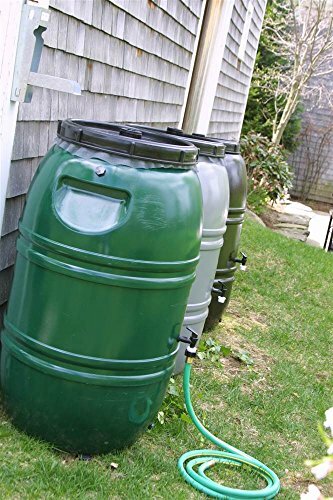 It is also the best built and most durable with a wall thickness of 0.19 in., resulting in a rigid, heavy duty rain barrel that will last virtually forever. Includes: insect screen, screw-on lid, overflow valve, drain plug, threaded plastic spigot, optional connection valve. Food grade, UV protected, highly durable 0.19 in. polyethylene. 39 in. H x 24 in. Diameter (20 lb empty weight). Our barrel is one of the largest capacity rain barrels available today! If you have any questions about this product by Great Amer. Rain Barrel, contact us by completing and submitting the form below. If you are looking for a specif part number, please include it with your message.